We have been waiting for these to arrive for forever now and they are definitely worth the wait. 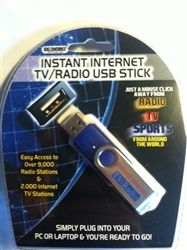 How cool is this…Instant Internet TV and Radio USB Sticks give you access to over 2000 TV stations and 9000 radio stations, instantly and without any monthly fees! All you need is your PC or Laptop and your ready to go. Listen to sports, radio and TV from around the world! We here at As Seen on TV Web Store have been having so much fun with these.